The high shear granulator bowl is of a vertical cylindrical design with a conical upper section for maximum mixing efficiency. The bowls are fixed to the machine base by means of a bayonet locking system and can be installed or removed without use of any tools. All bowls are equipped with transparent acrylic lids. The lids can be completely removed from the high shear granulator and is provided with an O-ring seal. The lid is fixed to the bowl with a knurled screw. There is a port for liquid addition and a temperature probe, if so equipped. The lid is equipped with a sintered metal filter. The mail impeller is one piece with three tangentially welded wing-tip type blades. The end of each blade is enlarged for maximum mixing efficiency. The impeller can be installed and removed from the high shear granulator without use of any tools. The chopper has two “U” shaped blades which are laterally mounted on the wall of the bowl. The chopper can be installed and removed without use of any tools. Both the impeller and the chopper drive shafts are equipped with Teflon (PTFE) seals, which can be easily removed for cleaning. The motors, variable frequency drives and controls are enclosed in a stainless steel frame with adjustable feet. The operator control panels are on the outside of the frame. 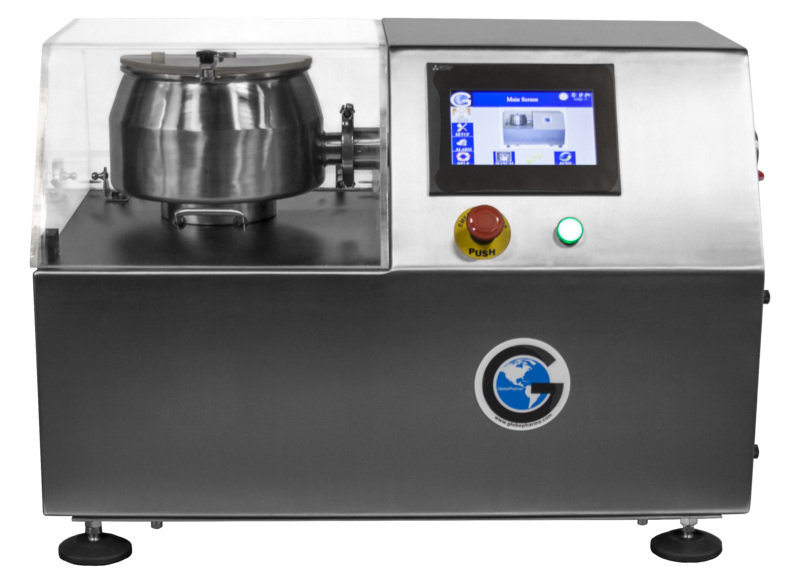 The machine is equipped with an acrylic safety-interlocked hood which covers the entire mixing area. The hood has a safety switch and must be in a closed position for the machine to be operated. A liquid addition port is provided on the hood. Both the impeller and the chopper speeds are controlled by variable frequency drives for infinite adjustment of speed over the entire speed range. Maximum impeller speed is 1500 rpm and the maximum chopper speed is 2200 rpm. The basic unit is equipped to operate 208-230V/1 Phase/60Hz. A transformer can be accommodated within the machine to operate it with 110V/60Hz. All the contact parts are made of 316 Stainless steel and polished to 0.8 μm finish. Exterior parts are made of 304 SS. The enclosure has satin finish.